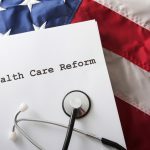 Although the U.S. Congress failed to repeal and replace the Affordable Care Act, we remain vigilant to monitoring future attempts of replacing the current health care system. 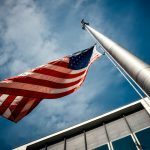 We have always advocated that any adjustments to the federal health care laws should be more inclusive to all Americans and should impose fewer restrictions to access quality health care. Health care and the system we Americans have built around it is incredibly complex, as we have all learned over the course of 2017. Though the immediate threat of repeal is over for now, it’s still important to familiarize yourself with terms being thrown about: pre-existing conditions, risk corridors, cost-sharing subsidies. The one we watched the closest? Block grants. We even made this infographic to illustrate. 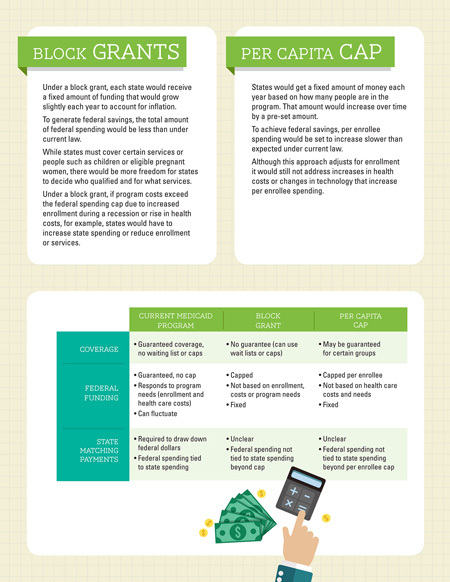 Block grants can mean many things, but in the context of the federal debate around health care reforms, here’s what we are talking about. 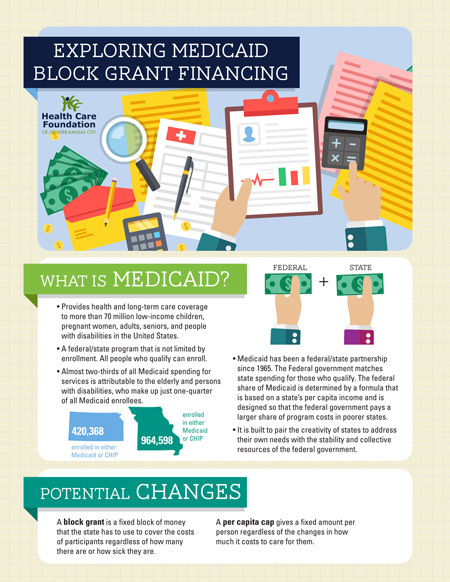 A Medicaid block grant. Under this scenario the federal government would provide a fixed amount of funding to states each year, with an annual adjustment to account for inflation. The intention of a block grant is to force a slowdown in Medicaid cost growth. In a per capita cap proposal, the federal government will provide a fixed payment to states for each person in the Medicaid program, with the payment adjusted annually for inflation. The federal payment to states will rise and fall depending upon the number of beneficiaries in the state. If a state has a surge in population or a recession hits and more people qualify a per capita cap accounts for these changes. To start, how will the federal government determine its fixed payment to a state? 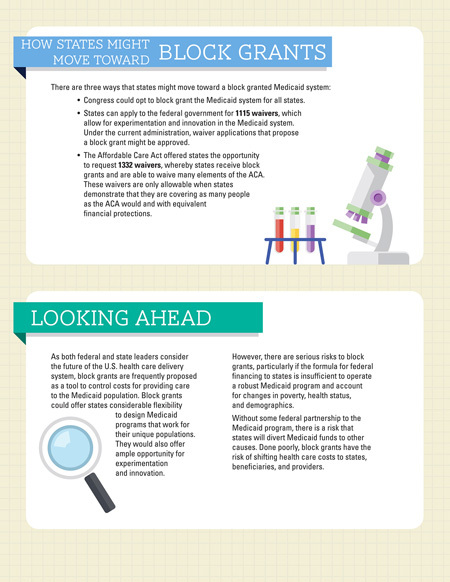 Block grant proposals have the potential to freeze health care access at a moment in time. States like Oregon and Massachusetts that have generous eligibility levels and have already expanded Medicaid might receive more federal funding and have a strong health care safety net for their residents. States like Kansas and Missouri would not. It would be the equivalent of hitting the “pause” button in our states — frozen, without Medicaid expansion and with low eligibility levels. We would receive less federal Medicaid funding as a result, and our consumers and health care system would suffer. Done poorly, annual cost adjustments could grossly underestimate the dollars needed to provide health care services, slowly eroding a state’s purchasing power. Most proposals adjust annual block grant funding according the economic inflation, which is almost always much slower than health care inflation. If the federal government offers states a “no strings attached” Medicaid block grant, states would have significant latitude that could hurt low-income consumers. For example, could states use their federal Medicaid funding to repair highways? It is critical that a block grant proposal provide federal bumper guards to ensure some minimum levels of access for low-income consumers. 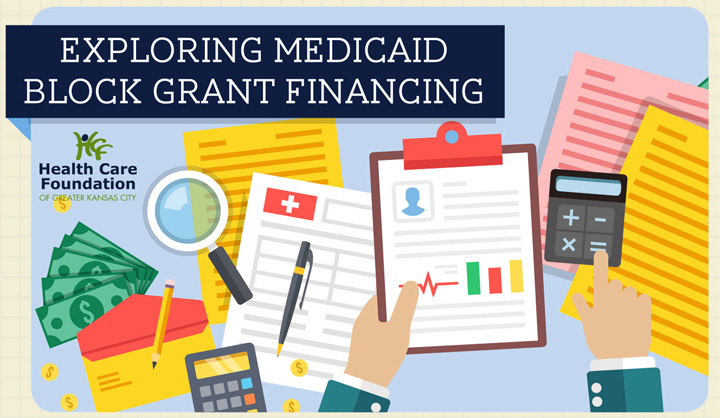 The intention of a block grant program is to rein in Medicaid spending, a laudable goal when you consider just how much the program costs the state and federal government. The Congressional Budget Office analysis of the American Health Care Act estimates that block granting Medicaid will, over the upcoming 10 years, result in $830 billion less in Medicaid spending. Now, is it possible for this belt-tightening to be achieved through wise policymaking and more effective care coordination? Certainly. However, it’s not likely. A huge bulk of Medicaid dollars are spent on vulnerable populations, like the aged and disabled. The simple fact is that it is expensive to take care of people with severe and chronic illness. Proposals to block grant the Medicaid system take an incredibly complex issue and punts major decisions down to states. 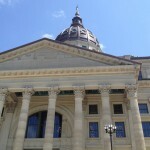 It will be up to state lawmakers to wrestle with a myriad of controversial, politically charged and highly technical issues. I worry that our lawmakers and administrative agencies don’t have the wherewithal to wrestle with the beast that is our health care system. If anything, the ACA and AHCA debates have demonstrated how unwieldy our health care system is and I have great fear about playing that debate out 50 times in 50 states. Block grant proposals have a real possibility to increase barriers to health for the vulnerable in our community. Medicaid is a little understood or appreciated program, but it is a huge support for so many folks in our community. It is important, in any debate going forward, that we encourage our federal delegation to represent their constituents and work toward a health care system that will serve us all, especially those in need.